Our handcrafted Christmas garland features gorgeous ornaments, exclusive ribbon bows, gilded faux berry juxtaposed with lifelike greenery base. 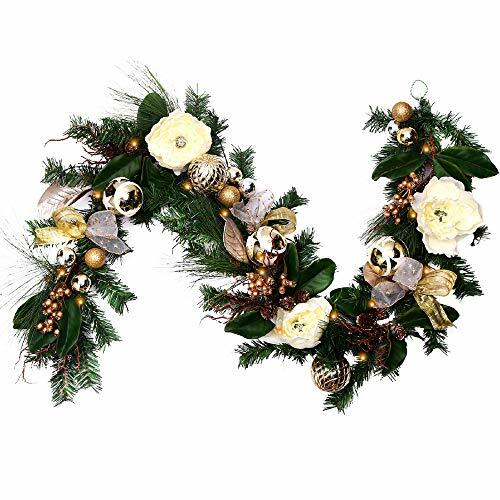 Our luxury champagne gold garland brightens up your mantel or your covered front porch. Our battery-operated is strung with 20 LED scattered throughout, which requires 3 AA batteries(not included). Dust and waterproofing to IP65 level makes our wreath suitable for indoor and outdoor. 8 variable modes and brightness settings provide the perfect solution for your decorative lighting needs. Some shaping required after unpacking to achieve maximum fullness. Keep away from high heat, sparks and open flames. The blend of gorgeous ornaments, gilded berries accented with glitter-veined eucalyptus leaves and stainless peonies, epitomizes the design of luxuriant nobility. The duet of mesh and edge-gilded ribbon bows adds a magnificent cheer of champagne sparkle. Ideal for mantels, doors and staircase. Timer mode and dimmable - 6 hours on, 18 hours off, auto cycle daily with 8 light effect scheme, Remote control can easily adjust the brightness of the lights. Exquisite gift box packaging for your exclusive friends and family, perfect match with our champagne gold Christmas wreath,ideal for mantels, doors and staircase. If you have any questions about this product by V&M VALERY MADELYN, contact us by completing and submitting the form below. If you are looking for a specif part number, please include it with your message.